The IKA mixing plant MHD essentially consists of the patented IKA inline mixing machine MHD, metering units, an electrical control system and a periphery which is customized to fit the customer’s application. The MHD plant enables the dust-free mixing of liquids and solids (powders or granules) in a continuous process. The phases to be mixed are fed into the MHD machine in proportion to quantity, then mixed in the working chamber and subsequently dispersed, allowing for a ready final product to be produced in just one passage.The plant is able to process solids contents of up to 80% and mixtures with viscosities of up to 50,000 mPas. The continuously working MHD plant amortizes itself very quickly when it comes to particularly large production quantities. 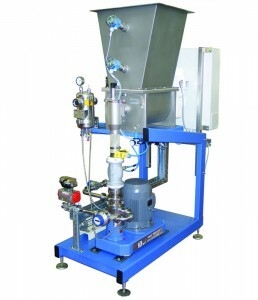 The funds invested into dosing are considerably lower than the purchasing costs for holding tanks and the appropriate mixing vessels with stirrers. Furthermore, the MHD plant offers great flexibility as any product quantities can be produced with a constant quality.